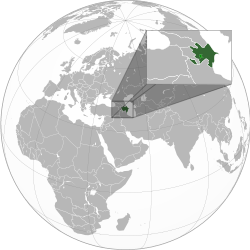 Location of Azerbaijan (green) and Artsakh[lower-alpha 1] (light green). Posicions respectivas a l'eissida de la Guèrra d'Aut Karabagh. ↑ LaPorte, Jody (2016). "Semi-presidentialism in Azerbaijan". In Elgie, Robert; Moestrup, Sophia. Semi-Presidentialism in the Caucasus and Central Asia. London: Palgrave Macmillan. 15 May 2016. pp. 91–117. doi:10.1057/978-1-137-38781-3_4. ISBN 978-1-137-38780-6. LCCN 2016939393. OCLC 6039791976. https://link.springer.com/chapter/10.1057/978-1-137-38781-3_4. "LaPorte examines the dynamics of semi-presidentialism in Azerbaijan. Azerbaijan’s regime is a curious hybrid, in which semi-presidential institutions operate in the larger context of authoritarianism. The author compares formal Constitutional provisions with the practice of politics in the country, suggesting that formal and informal sources of authority come together to enhance the effective powers of the presidency. In addition to the considerable formal powers laid out in the Constitution, Azerbaijan’s president also benefits from the support of the ruling party and informal family and patronage networks. LaPorte concludes by discussing the theoretical implications of this symbiosis between formal and informal institutions in Azerbaijan’s semi-presidential regime." ↑ 4.0 4.1 4.2 4.3 "Azerbaijan". International Monetary Fund. ↑ "Gini Index". World Bank. Retrieved 13 December 2017. ↑ "Human Development Report 2016 – "Human Development for everyone"" (PDF). United Nations Development Programme. 2016. Retrieved 21 March 2017. Boggan waxaa markii ugu dambeysay wax laga bedelay 10:12, 29 Luuliyo 2018.